One of my favourite places to visit in Toronto is Union Station. Union Station is the main commuter centre in Toronto for transit encompassing both a TTC Subway line and GO Transit trains and buses that help connect Toronto's downtown with the immediate city of Toronto and its outer suberbs. Also, VIA Rail runs trains that help connect the rest of Canada with Canada's largest urban centre. 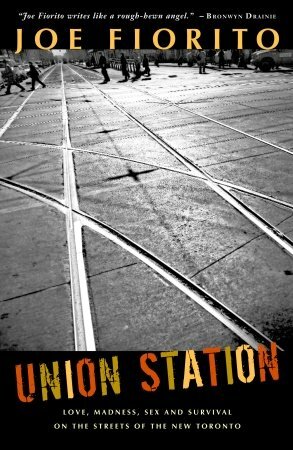 Basically, Union Station is at Toronto's heart. If you want to know what is going on in Toronto, Union Station is usually the place to start. Just by watching the people coming and going through the station you can see what sporting events are going on at the neighbouring Rogers Centre and Air Canada Centre. baseball caps, hockey sticks and basketball jerseys are usually good indications what is happening. Tourists are usually prevalent here as well because of both the visual aspects of Union Station's great hall and because of its many connections to transit. 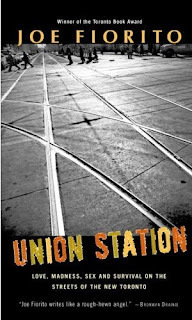 That may be why Joe Fiorito, author of Union Station, chose to name his book the way he did. Fiorito's book, after reading the dust jacket and random pages inside, takes a look at why Toronto is a city to be loved and not hated. Sure Toronto may have its rough edges with the homeless on every corner and seemingly out of touch politicians at both the municipal and provincial levels who really don't seem to understand the city. But what Fiorito seems to argue in the book, according to the dust jacket and the very few pages I have read, is that the little guy has stories to tell that can be endearing and entertaining. When I first picked up this book immediately put it down. I was merely browsing at a downtown Toronto Chapters book store. I read a couple of excerpts here and there of the book and wasn't really engaged. Perhaps I wasn't in the mindset of looking for a book to devour at that time as I didn't leave the store that day with anything. Also, I normally skip Fiorito's columns as sometimes they seem plodding and boring to me in context to the rest of the days news in the Toronto Star. So I asked myself after going back to the same book store two weeks later and purchasing the book that I put down earlier? I'm not sure. Perhaps it was the sections I read that touched my heart. Perhaps, it was the page I read about the homeless situation in Toronto that I hear so much money is being poured into yet these people are still on the street. There are a lot of options. After a quick flip through the book and reading a couple of first pages of chapters it appears as if each chapter of Fiorito's book deals with different topics about the city of Toronto. So over the next little while as I read the book I hope to reflect through blog entries my thoughts on the book. Consider this entry to be the first.